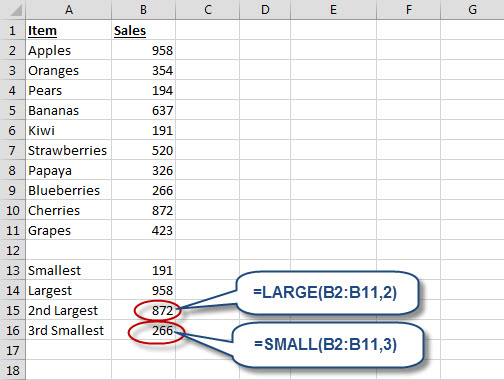 Identifying Largest and Smallest Values in an Excel List » Accounting Advisors, Inc. Periodically, you may wish to rank a series of items within an Excel spreadsheet. Many users often rely on sorting data in ascending or descending order. I'll describe an alternative that uses the LARGE and SMALL functions to create an ordered list of whatever you'd like to rank. 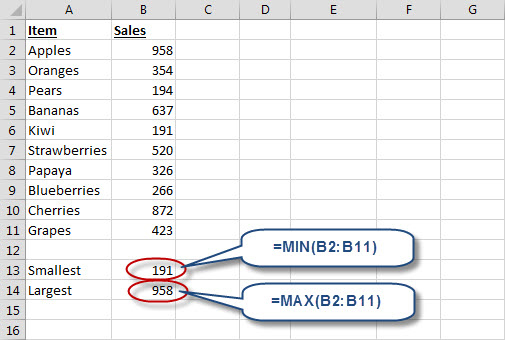 You're probably already familiar with the MIN and MAX functions in Excel, which return the smallest or largest value within a list, respectively. As shown in Figure 1, MIN indicates the smallest value is 191, and the largest value is 958. MIN and MAX are limited to the single smallest or largest values respectively, but LARGE and SMALL allow you to return the second largest or third smallest value if you choose. I'll explain these functions in a moment, but first let's explore MIN and MAX. Figure 1: MIN and MAX return the largest and smallest values from a list, respectively. Figure 2: LARGE and SMALL return the nth values from a given list. I'll explain MATCH and INDEX in more detail in an upcoming article, but for now the short answer is that in this case MATCH is determining which row a sales figure amount is on, and then INDEX returns the corresponding text from column A. This is akin to VLOOKUP, but with the flexibility of being able to look up data from the left, which VLOOKUP can't do without making a special provision. There's one caveat to this approach that you should be aware of. If the same value is on your list twice, then MATCH/INDEX will return the corresponding name twice. Next week I'll describe how you can use the COUNTIF function to create a tiebreaker that will give you a unique value to match for each item in the list. 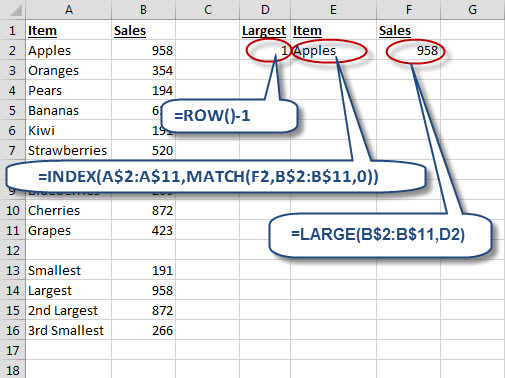 In any case, once I have the formulas in cells D2 through F2 in place, I'm able to copy the formulas down as many rows as needed without any additional modifications, as shown in Figure 4. Do keep in mind that if you drag too far, LARGE or SMALL will return #NUM!. 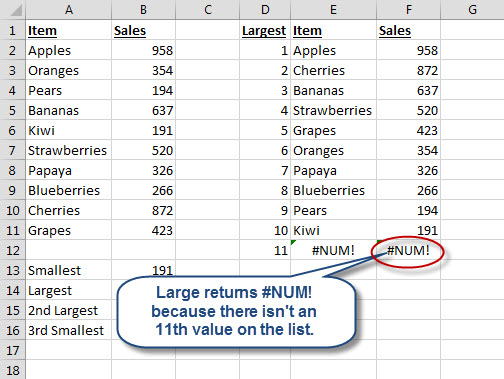 Figure 4: If you drag the formulas in cells D2:F2 too far, LARGE will return #NUM!.